Introduction: Historian Stewart Ash provides this story of an interesting early cable pendant. As is often the case, the history of the object has not survived unscathed by time, and Stewart has accordingly corrected the record here. The cable in the pendant is undoubtedly the cable made for the first Atlantic telegraph cable; its design is unique. Below is a cross section and telescope drawing of the cable, taken from the life story of Sir Charles Tilston Bright (1832-1888), who was the engineer for the project . For his work on the cable Bright was knighted by Queen Victoria at the age of 26, becoming Britain’s youngest knight and receiving the first Knighthood to be conferred for technological achievement. W H Russell’s book about the Atlantic Telegraph describes how the 1865 Atlantic cable was made. Russell was a veteran war correspondent for the Times and sailed on the SS Great Eastern for the unsuccessful attempt that year to lay an Atlantic cable. The cable for that project was a completely different design to that encased in the pendant.. Concerning the cable in the pendant: This cable was ordered by the Atlantic Telegraph Company; initial contracts were placed for 2,500 nautical miles (1 nm = 6,086 ft) of core at £40/nm from the Gutta Percha Company at 18 Wharf Road, City Road Islington. The cable was armoured by twp companies, R S Newall & Co of Birkenhead and Glass, Elliot & Co at Enderby’s Wharf, Christchurch Way, Greenwich (this is still a submarine system factory belonging to Alcatel-Lucent Submarine Networks). The contract values were £62,000 each. Manufacturing was complete by 6th July 1857. Two ships were used to lay the system, the Agamemnon and the Niagara. The first attempt to lay the cable, the route of which was from Dowlas Bay, Valentia Island in Ireland to Trinity Bay, Newfoundland, commenced on the 5th August 1857. However, after 330 miles of cable had been laid the cable parted and was lost in 2 nm of water on 11th August and the project was abandoned until the following summer. During the winter a further 900nm of cable was manufactured by Glass, Elliot & Co. The cable lay was recommenced in June 1858 and successfully completed on 5th August 1858. The cable worked for a few short weeks and then failed. Much of the remaining cable from the laying operation was sold to Tiffany & Company and assorted gifts and jewellery made from it. This cable was obviously not available in 1851, so it is my belief that the true date is 1857, the 7 having been mistaken for a 1 in the description at the head of this article. The cable could have been made in Birkenhead or Greenwich, but this could only be determined from a longer sample; as each company used a different lay for the armour wires. However, as it was presented by Mr Brett, it is most likely that it was made in Greenwich, as the Brett Brothers were both London based. Concerning Mr Brett: There were two Brett brothers, the elder John Watkins Brett (1805-1863), was a dealer in art, paintings and objets d’art and was dubbed by the Times, in 1855, “The Father of Submarine Telegraphy”. His younger brother Jacob Brett (1808 –1898) first stimulated the family interest in telegraphy. Together they pioneered submarine telegraph by laying the first ever submarine cable across the English Channel between Dover and Calais on 28th August 1850. Although the cable only worked for a short period it proved the possibility and they were back in 1851 to lay a successful cable the following year. The brothers then went on to lay cables across the North Sea and the Irish Sea before unsuccessfully attempting to lay a cable in the Mediterranean. John Watkins Brett was a Director of the Atlantic Telegraph Company and along with Cyrus W Field and Charles Tilston Bright one of the leading promoters of the Atlantic Cable. Jacob only had a minor role in the Atlantic Cable Co, therefore it is most likely that the Mr Brett referred to is John. Concerning the Great Eastern: The contract for building Isambard Kingdom Brunel’s ship the Great Eastern was let to John Scott Russell on 22nd December 1853. The ship was built in his yard and the adjacent Napier yard at Millwall on the Isle of Dogs, in London. After many problems, the first attempt to launch her was made on 3rd November 1857; there were many parties arranged by the directors of the companies involved, much to Brunel’s annoyance. The attempt was a failure and the vessel was not finally floated until 31st January 1858, with much less ceremony. The vessel was then moved across the river to Deptford for fitting out. She sailed down the river to Purfleet in readiness for sea trials on 7th September 1859. If the party was held at Belvedere to watch her sail by as she went down the river this would be have to be the date, as the ship never returned to the upper Thames. Concerning Sir Culling Eardley (1805-1863): He was born Culling Eardly Smith. His father was Sir Culling Smith (2nd Baronet) and his mother was Charlotte Elizabeth née Eardly, the daughter of Baron Eardley. He inherited his father’s Baronetcy in 1829 and changed his surname to Eardley in 1847 when he inherited his wife’s mother’s family estates. This included Belvedere House, near Erith, in Kent. He married Isabella Carr in 1832 and had a son Eardley Gideon Culling Eardley and two daughters, Frances and Isabella. Eardley was not directly concerned with the Atlantic Cable; however, on the completion of the loading of the Agamemnon at Greenwich in the third week of July 1857, he held a fête champêtre (large garden party) for workers at the factory, officers and men of the Agamemnon and senior members of the companies involved. This party was reported in the Times of 24th July 1857 (see below) and part of this report is reproduced in “The Life Story of Sir Charles Tilston Bright, Civil Engineer”, written by his son Charles Bright. I believe the reference to the Great Eastern is incorrect; the ship involved was in fact HMS Agamemnon. Clearly the pendants were presented by John Watkins Brett to Sir Culling Eardley as a thank you for the party and, as I originally suspected, the date was July 1857 not 1851. 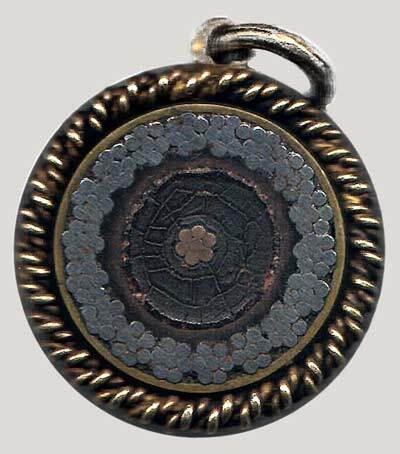 The cable in the pendant was therefore made at Glass, Elliot some time during the first half of 1857, and is a most unusual memento of the first Atlantic Telegraph cable. The gala as reported in The Times, 24 July 1857"
All the details connected with the manufacture and stowage of the cable are now completed, and the conclusion of the arduous labour was celebrated yesterday with high festivity and rejoicing. Al the artisans who have been engaged upon the great work, with their wives and families, a large party of the officers, with the sailors, from the Agamemnon, and a number of distinguished scientific visitors, were entertained upon this occasion at a kind of fête champêtre at Belvidere-house, the seat of Sir Culling Eardley, near Erith. The grounds round Belvidere-house are unusually rich and picturesque, and, as the day was magnificent, the scene was one of peculiar gaiety and animation. An immense marquee was on the lawn in front of the house, under which a sumptuous cold collation was provided for the 850 visitors of all ranks who were invited to share in the rejoicings of the day. Captain Sands, with the officers of the Susquehanna frigate, was present, with Professor Wheatstone, Professor Morse. Sir F. Thesiger, Mr. Cardwell, M.P., Mr. Cyrus Field, Mr. Raymond, and many other gentlemen of note, both English and American. We need say no more as to the extent and liberality of the commissariat than that it was under the charge of Mr. Staples, who, of course, took care that all, from the highest to the lowest, should be pleased with his catering. In addition to this substantial aid to enjoyment, the bands of the Royal Marines and Royal Artillery were in attendance. Cricket and trapball, with other games, were provided for the amusement of the men, who notwithstanding the almost tropical state of the atmosphere, entered into them with a zest which made one feverish to behold, The dinner took place at o'clock, Sir Culling Eardley presiding as chairman. The invited guests were seated at a semi-circular table, which ran round one side of the marquee; the sailors and artisans at smaller tables at right angles with the principal one. At the conclusion of the dinner the usual loyal toasts and speeches expressive of the amity and cordial feeling which exists between this country and America followed, and were most enthusiastically received. Mr. Cyrus Field, one of the principal promoters of the great plan, in returning thanks, read a letter which he had received from the President of the United States, in which Mr. Buchanan warmly expressed his sense of the honour which it would be to him to receive the first message on the completion of the undertaking; and this, Mr. Field said, it had been arranged should be sent from this side Of the Atlantic by no less a personage than Her Most Gracious Majesty. Mr. Glass, the maker of the Greenwich half of the cable, in a few brief and well chosen remarks adverted to: the manufacturing difficulties which had to be overcome in the completion of such a gigantic work within so brief a period, the contract having only been made last January, and 2,600 miles in all now finished, shipped, and ready for the fulfilment of their great international duties. After the dinner the bands played a well-chosen selection of hornpipes, polkas, &c., which brought out the agile capabilities of the Blue Jackets in a strong light, and made a. most amusing portion of the day's proceedings. Sir Culling Eardley was busy always and everywhere looking after the comfort of his guests, and the day passed off without a single contretemps to mar its general hilarity.